The SStS Peru course begins amidst the stunning mountain landscapes of the Sacred Valley near Cusco. 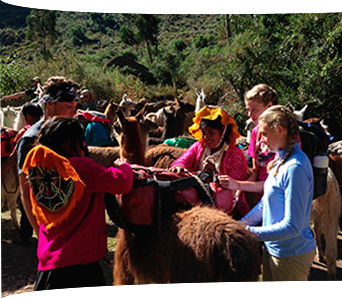 The first days will be spent acclimatizing, exploring Urubamba, participating in various cultural activities, and learning about the Llama Pack Project, our non-profit partner, at the pasture where they raise llamas. Although communities in the Sacred Valley have rich cultural backgrounds rooted in breathtaking settings, many residents are forced to work in cities far from their homes. The Llama Pack Project works to reestablish the use of llamas as pack animals in these high Andean communities as a way to provide an attractive economic alternative to urban dwelling. In addition, the Llama Pack Project works to conserve the precious ecosystems of these communities through environmental education and conservation projects. 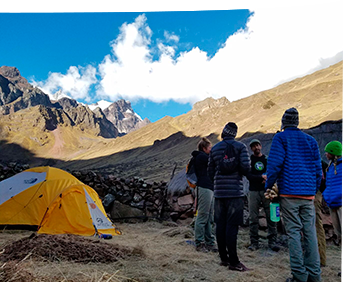 After spending the first few nights at the Llama Pack House in Urubamba, SStS participants will hike to an Andean community were they will stay in tents or the local community center. While in the community, they will spend a few days teaching environmental education classes and fixing a playground or doing maintenance at a local school. Before the second week of project work, SStS participants will tour some sites in the Sacred Valley and take a class on Andean conservation. After these activities, students will learn more about the mission of the Llama Pack Project during their second week in the Andean community. In this stunning location, they will continue to teach environmental education and work shoulder-to-shoulder with community members on a conservation project such as building a native tree nursery or a llama pen. Upon completion of this project, the group will do a llama trek back to Urubamba before visiting Machu Picchu, a UNESCO World Heritage Site. In this striking setting, students will have the opportunity to consider what they have learned about ethical leadership. The Llama Pack Project teaches Andean villagers how to raise pack llamas for the tourism industry as tools for sustainable development and conservation of mountain ecosystems. To learn more, please visit their website. Students will begin by teaching environmental education and fixing a playground or doing maintenance at a school. Then, they will work on a project such as a native plant nursery or constructing a llama pen. 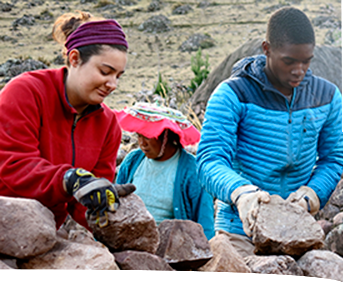 During both weeks of project work, students will trek to an Andean community. The group will carry packs as they hike through high-altitude mountainous terrain. It is critical that participants actively prepare prior to travel so they are physically fit. During the first and last days of the course, the group will stay in a hostel for volunteers in shared rooms with bunks. While at the project sites, the students will stay in a simple community center in a remote Andean village situated at a high elevation and then camp in tents during a two day llama trek. After arriving in Cusco, the group will drive for a couple hours to Urubamba where they will stay for the first few days. They will then drive and trek to the project site. Finally, they will take a train to Machu Picchu before returning by van to Cusco. Although the group will spend a lot of time with the children at a school and stay in remote villages, they do not stay in the homes of individual families. In addition to several days spent outside of the small city of Urubamba, the group will spend ten nights in remote Andean communities. I learned that we should look at the world’s problems as all of our problems and work together to solve them. I also learned more than I can put into words about the value of resilience, a positive attitude, and education. Project work teaching environmental education and repairing a playground or doing maintenance at the local school. During the travel phase of each SStS course, students spend time reflecting about the learning that occurs through their immersion and service experiences. These posts capture the impact of our programs on individual students. Explore the posts below to learn about the SStS Peru program from the important viewpoint of our students.